102 p., 15,5 x 23,0 cm. 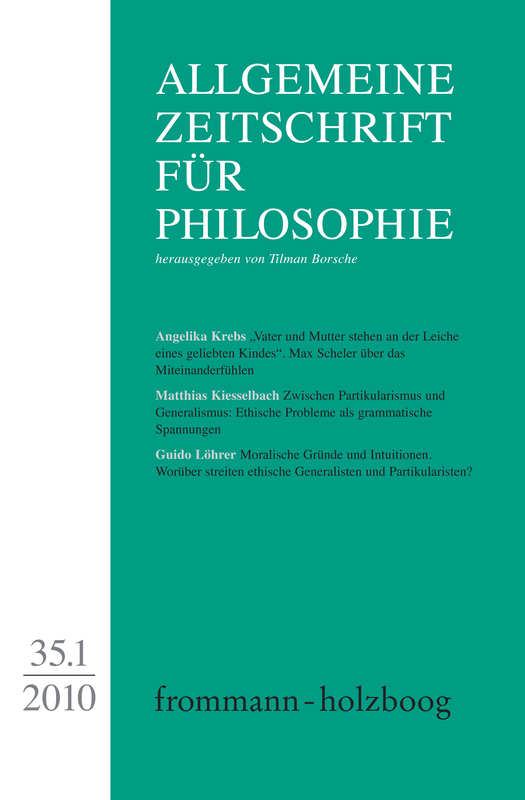 With contributions by Peter Baumanns, Matthias Kiesselbach, Angelika Krebs, Guido Löhrer and Olivia Mitscherlich. When two parents mourn together the death of their beloved child what they feel for each other is not just empathy or compassion. Rather they participate in a shared feeling. This shared feeling is not to be confused with emotional contagion or identification. It is also differs from parallel feeling. The German phenomenologist, Max Scheler, was the first to systematically introduce the category of shared feeling and to differentiate it from related phenomena. You cannot understand friendship, love and other forms of community without understanding shared feeling. This article critically reconstructs Scheler’s classical analysis and illustrates it with a literary example, Henry James’ short story »The Pupil«. This essay argues that there is room for a third position between moral particularism and moral generalism in their orthodox forms. The view proposed in this essay is inspired by the later Wittgenstein’s conception of grammar and holds that formulations of ethical principles can be interpreted as grammatical statements, while ethical problems can be interpreted as instances of grammatical tension. On this reading, situations in which ethical principles turn out to conflict come out as moments in the evolution of language. Three consequences are discussed and welcomed as general insights into the workings of language. Guido Löhrer: Moralische Gründe und Intuitionen. Worüber streiten ethische Generalisten und Partikularisten? The controversy between meta-ethical generalists and particularists concerning an appropriate understanding of moral reasons is a dispute over the question what the correct moral theory is. To the extent that this is the case, there are methods available which help to solve the dispute in question. Moral theories should not massively contradict those of our moral intuitions which are manifest common- sense beliefs. Therefore, it is necessary to test them against strong moral intuitions. However, to the extent that the dispute is based on differences that are hardly ever reflected in moral appraisal, the dispute is likely to be undecidable. It is within this context that the article questions J. Dancy’s approach, which considers holism as the ideal way to a sustainable particularism, and suggests instead to separate the discussion about holism from the substantial debate. Olivia Mitscherlich: Das Geheimnis denken (zu Gunnar Hindrichs, Das Absolute und das Subjekt).